Dandy Dog Training, located only 11 miles outside of Carlisle. The main room is 4800 square feet and the addition, the Rainbow Room, is 1400 sq. ft. The training facility was official openned in 2004. 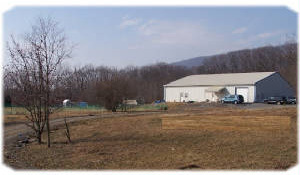 Dandy Dog Training sits on 11 acres of partially wood land with a 'lighted' 100' X 120' fenced in agility field plus a 60' X 100' fenced exercise field. 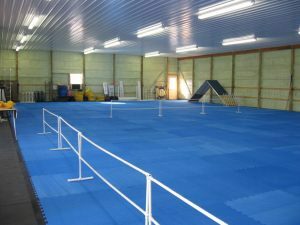 The building has an asphalt floor with a rubber sheeting cover and now has Agiliflex mats. It is also fully insulated to help keep you and your dog at a comfortable temperature.